The Experiential Planner Expo, also known as EPEX is gearing up for its annual edition on June 27-29, 2019 to help connect, enhance and promote networks amongst Global Destinations, Venues and Suppliers and the Indian MICE and Destination Weddings Industries. Co-located with the WOW Awards and Convention Asia, EPEX is the quintessential platform where more than 400 global industry leaders and stakeholder will meet on a one-to-one basis to discuss enhanced Outbound Event opportunities. Some of the destination partners for EPEX 2019, include, are Qatar National Tourism Council, Atout France, Dubai Business Events, Vienna Convention Bureau, Croatian National Tourist Board, Dubrovnik Tourist Board, Zagreb Tourist Board & Convention Bureau, Brand USA, San Francisco Travel, Philadelphia Convention & Visitors Bureau, Barcelona Convention Bureau & Barcelona Weddings, Convention Bureau Italia, Padova Convention & Visitors Bureau and Ras Al Khaimah Tourism Development Authority. “The first experience in India for me, has been a great success. I have done many appointments, and I have met interesting people and potential new clients, both during the exhibition and social program. 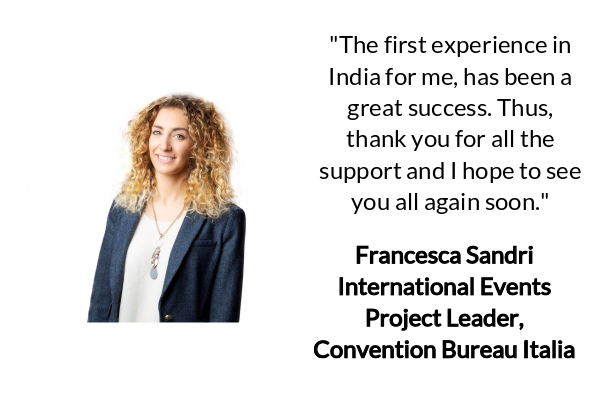 Thus, thank you for all the support and I hope to see you all again soon”, commented Francesca Sandri, International Events Project Leader, Convention Bureau Italia. Hotels associated with EPEX include, Ritz Carlton- Doha, Lapita, Dubai Parks and Resorts, Autograph Collection, Palazzo Versace Dubai at Jaddaf Waterfront, Taj Dubai, Le Méridien Dubai Hotel & Conference Centre, Hilton Hotels & Resorts- Vienna, SO/Vienna, The Ritz-Carlton Abu Dhabi- Grand Canal, St Regis Abu Dhabi, Fairmont Bab Al Bahr, Emirates Palace, Four Seasons Hotel Bahrain Bay, Sofitel Bahrain Zallaq Thalassa Sea & Spa, DoubleTree by Hilton Ras Al Khaimah, Shangri-La Hotel & Resorts, Colombo, Corinthia Hotels International & Jumeirah Hotels. “One of the biggest challenges of being an event planner in India is building lasting relationships that add value to your work as corporate meetings and MICE planner. EPEX at WOW was one such platform that enabled me to network with the most exciting destinations and hospitality partners under one roof. 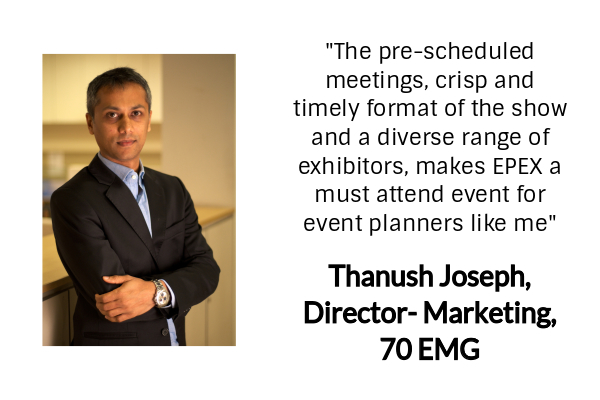 The pre-scheduled meetings, crisp and timely format of the show and a diverse range of exhibitors, makes EPEX a must attend event for event planners like me”, said Thanush Joseph, Director- Marketing, 70 EMG. Planners from across the MICE and Destination Wedding industries can make that important connect, not only with Destinations and Hotels at EPEX, but also amongst a variety of airlines, attractions, DMCs, venues, that are also showcasing at EPEX 2019. These include, Simon Shopping Destinations, Ocean Park Hong Kong, Etihad Airways, CrystaLight Events-Armenia, Pegasus Columbus DMC, Vienna Unique Museum Venues, Vienna Messe Wien Exhibition & Congress Center, Vienna Palais Events Veranstaltungen GmbH and many more!